About advertising on Google's display network. About the Display Planner Tool. Let's take a look at how we can leverage Google's content network. Content ads are different from search ads. How Does Advertising on the Display Network Work? Google scans a page within their content network and then assigns a theme to that page. 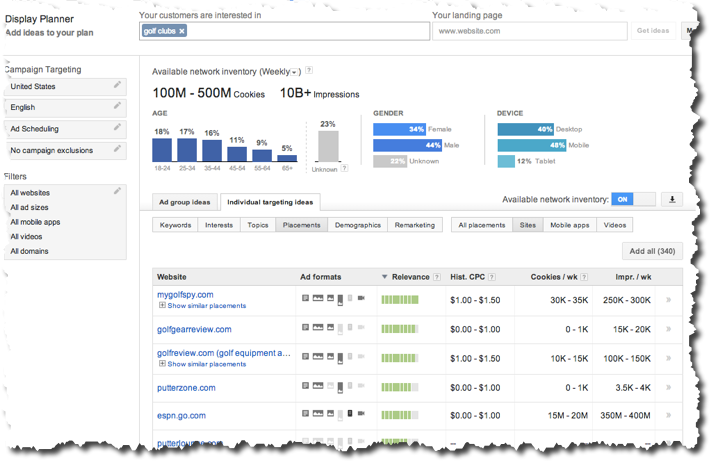 Google scans your ad groups and based on all the keywords in each of your ad groups Google assigns a theme to that ad group. When a content page and your ad group contain the same theme, your ad can be displayed on that page. Content network ads will obey all your campaign settings (e.g., location, budget, etc.). For content ads, Google will only consider negative keyword match. You cannot set different bid amounts for each keyword as all the keywords are looked at as a group to decide your theme. It is highly recommended that you create a separate ad campaign for your content ads. Automatic Placements: Google decides where your ads will be shown based on the process which we discussed in the above section. Managed Placements: You get to choose where your ads will be displayed. When you start a new campaign, you can choose a few options: Search Network with Display Select, Search Network Only, or Display Network Only. If you were to choose the first or third option, Google will automatically select the most closely aligned sites to show your display ads on, based on relevant, matchign content. Within either of the two options mentioned above, you can also choose whether to display these ads on all available display network options, just on mobile devices, or just to people who have previously visited your website (remarketing). Navigate to the Campaigns tab and select the campaign that you want to use for targeted placements. 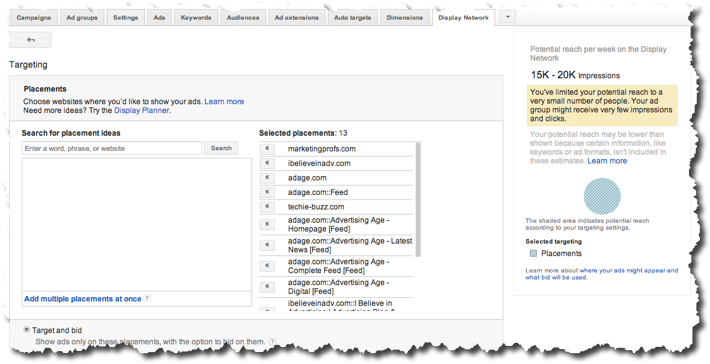 Select the Ad Group for which you want to use targeted placement (remember content network uses the concept of themes). Add the list of domain names where you would like your ad to be displayed. Use the negative sign (-) in front of domain names on which you don't want your ad to be displayed. Navigate to the Tools tab and select the Display Planner option. Under Get ideas and estimates option, fill in your target keyword or website. For the screenshot below, I chose 'golf clubs' as a test. You will then see the available inventory for websites matching your target cateogory, demographic breakdowns, device breakdown, and the list of specific websites that Google recommends. Take a look at the sites and determine best matches for your ad groups, and click on the double right arrow to choose a site. 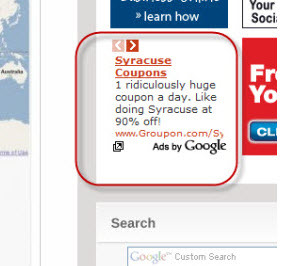 You can then place the site(s) in specific ad groups you have live.